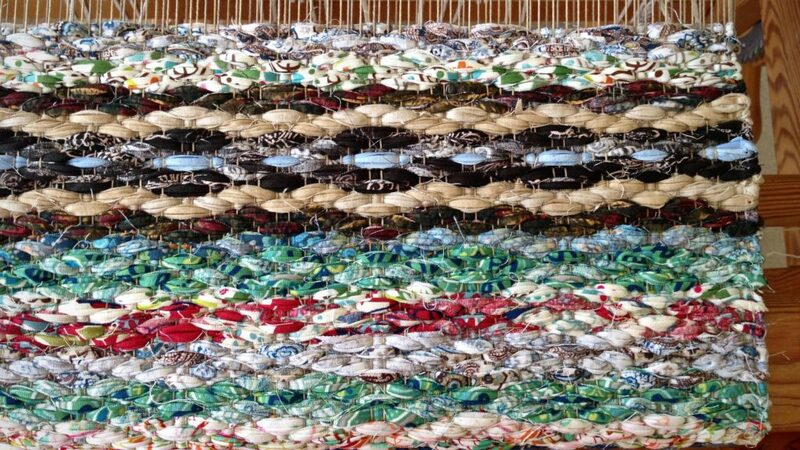 This is a stash-busting rug, using leftover cut strips from previous rugs. Like my other rag rugs, I start with a plan. Then, I get out my fabric and make my color selections. It’s plain rosepath, without tabby picks in between, perfect for a stash buster. Snip, snip, snip. Fabric snippets are taped to my idea sheet. These are my blueprints–weaving draft, treadling order, and idea sheet with fabric snippets. I am weaving! Without tabby picks the rosepath pattern takes on a compressed form. I can, and do, make adjustments at the loom. But I keep one question in mind. Will my choices along the way fit with the overall design of the rug? My idea sheet serves as a guiding compass. It’s a reminder of the big picture that forms a cohesive design. Idea sheet hangs from the beater clip on the Glimakra Ideal loom. 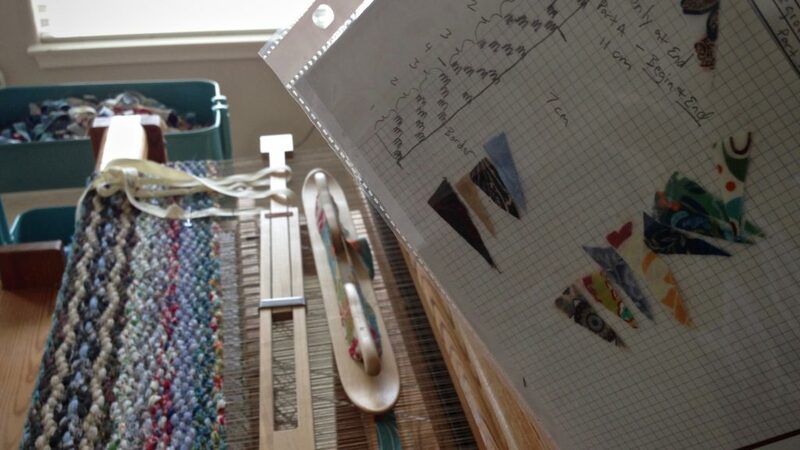 The treadling pattern, penciled on graph paper, and fabric snippets provide a quick reference while weaving. Guiding principles shape our lives and enable us to make wise decisions. A compass sets the course. Use a true compass. Live in a way that pleases God. This is a valid compass for all choices and decisions. The Grand Weaver has the comprehensive design. Amazingly, He weaves our leftover fabric strips into his design, and uses them to make something useful and beautiful. May you see your part in the overall design. I do enjoy and look forward to reading all of you postings. Though we have not met in person, I think of you as a kindred spirit as we seem to think alike in more ways than one. Thank you for sharing and blending your faith and knowledge of weaving. It always adds a ray of light to my day and some inspiration to my weaving. Dear Linda, It means a lot to me to hear your sweet encouragement. You have added a ray of light to my day! Dear Linda, I want to thank you for your blog, I dont make many comments but I wanted you to know that I am brightened and inspired so much by you. Im English and live in Italy, in the 11 years I have lived here I have only met one other weaver, I am a self taught weaver and love it, but its a lonely trek, so wanted you know how your encouragement lifts my days. Yes, I agree with Janet. Like her, I am pretty much a self-taught weaver who travels a lonely path. Blogs like these remind me of something that I think CS Lewis said: “We read to know we are not alone”. I am English, living in South Africa. Hi Jane, You make me so happy! I love the thought of connecting weavers to a community. And it’s great to hear someone quote one of my favorite authors! Thank you for encouraging me today. I really like the idea of “connecting weavers to a community”, Karen, and this blog certainly helps to do that. In fact, you’ve got me thinking! Karen, your words and connections to weaving ( and weavers! ) is indeed inspiring. Also a self taught beginner weaver living in Alberta Canada, though I too travelled far as my husband and I moved when the military needed us to. I have found many ways to learn this artform, but I would much rather read your words and follow your journey by reading old and new posts, than join groups on Ravelry.com for inspiration. You are a great teacher and I will try to be a better “listener” … so much thanks! You have encouraged me more than you know. It’s exactly for you, and others like you, that I write. I truly cherish the connection we have as weavers and long-distance friends.